Brian Longhurst is an extraordinary and profoundly uplifting author, teacher and illuminary, who has an enduring, personal relationship with Jesus. He's an avid student of A Course in Miracles and this book includes references to ACIM text as well as Brian's personal stories. You can find more of his writings on his web site: Honest2Goodness.org.uk, where he shares his "Messages of Encouragement" and "Diary of a Christ Communicant." This third book in Brian Longhurst’s ‘Kingdom series’, shines a light on what Jesus reminds us of in the book "A Course in Miracles": We are not a temporal body, but an eternal, all-Knowing, all-Loving, unified Mind and Spirit – just like our Creator. Each chapter sets out easy-to-follow and understand explanations of how a Great Awakening to the remembrance of our endless reality as Papa’s Beloved Son is taking place right now. Join this journey that makes plain how true, unconditional forgiveness heals our minds from guilt, fear and belief in mortality, to perfect, unending Divine Love, peace and joy. 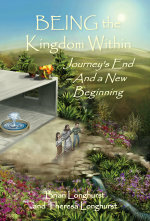 Entering the Kingdom Within clarifies this deep mystical reality – from a sometimes personal, yet universal perspective – with humour that elucidates what for many can seem hard to comprehend. “Hearty and generous, this book is a celebratory stew of commentary, insight, story telling, and so much more that will aid the spiritual student. Brian Longhurst is an eloquent writer who is incisive in shining Light on current issues, and brings a fresh perspective on the path of spiritual Awakening through Christian mysticism – all in accord with A Course in Miracles.” –Susan Oliver, Wooler, England. 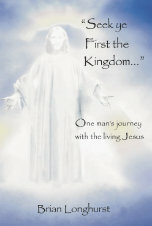 "Seek ye First the Kingdom..."
What readers have to say . . .